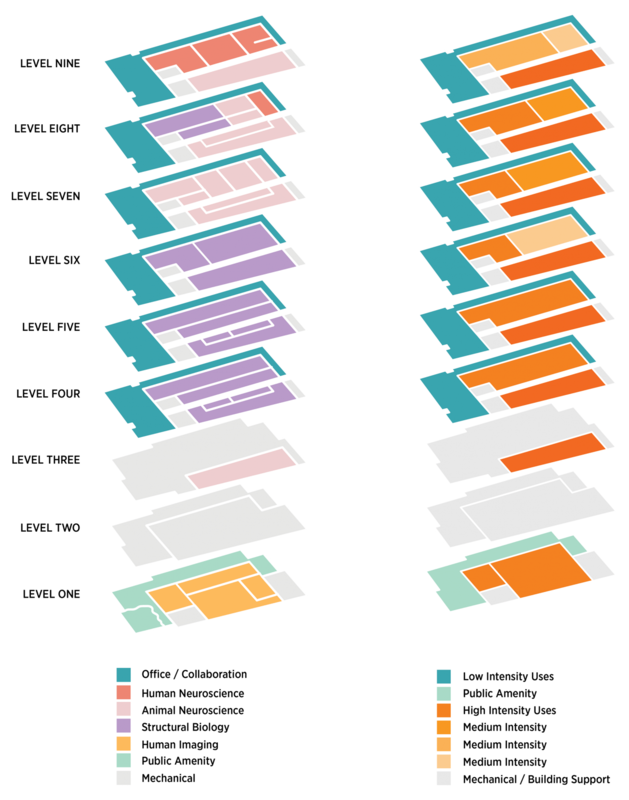 Flexibility is a consistent theme in all modern research facilities, but is often achieved by designing to the most demanding programs and accepting that few of the operational spaces will actually need or use the full capabilities available. 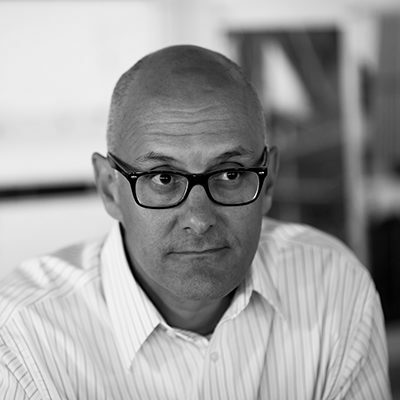 This leads to significant investment in underutilized infrastructure and can compromise the efficiency of systems that are forced to operate well below their optimal levels. 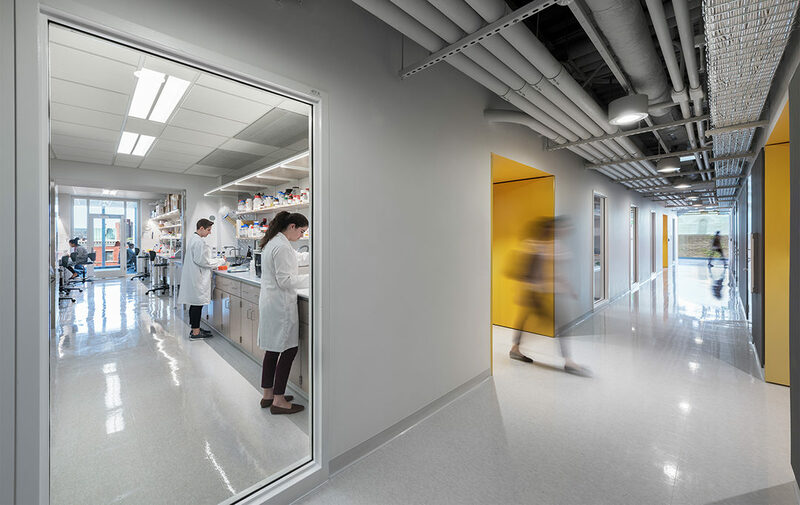 When designing our Boston University Rajen Kilachand Center for Integrated Life Science and Engineering, we wanted to achieve a space efficient building that could accommodate many unknown research needs. 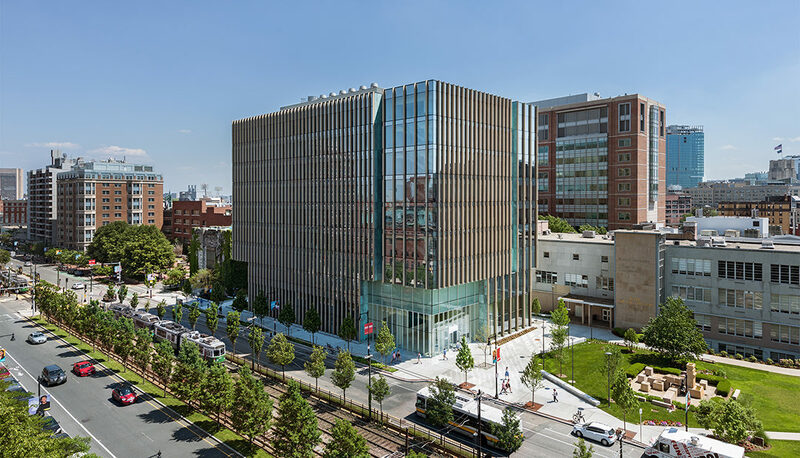 Boston University required an interdisciplinary building to bring together life scientists, engineers and physicians for the study of systems neuroscience, cognitive neuroimaging and biological design. 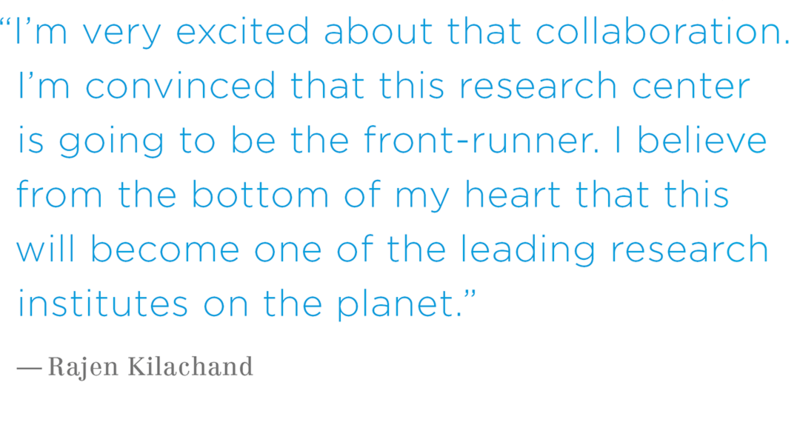 In lieu of a “one-size-fits-all” approach to program distribution, the Kilachand Center was designed for targeted flexibility to accommodate a broad array of research pursuits. A layered approach was implemented on each floor by creating low, medium and high intensity zones. As a result, the building can accommodate a wide range of research pursuits while limiting the amount of space designed to the most stringent and costly performance requirements. By regularizing the structure, mechanical system and building footprint, each of the six research floors are designed identically. Because of the lower floor air handling rooms, the supply air ductwork reduces in size as the exhaust ductwork increases in size moving vertically through the building. This allows for the main shafts to remain constant in overall dimension and so the net assignable area on each floor is effectively constant. The work horse of the floor plate is the medium intensity, basic research lab zone. This occupies the majority of the building footprint and is designed around the most basic HVAC, power and vibration requirements of biochemical research. Importantly, the air handling is kept to a code minimum of 1 CFM per square foot and supplemental cooling is provided through demand-based hydronic systems. Because this building is not designed exclusively for bench-type open labs, the design includes features to allow for easy accommodation of spaces of all sizes. Each floor is also designed to include an area of enhanced capabilities to support unusually demanding research. This area has improved vibration isolation as well as access to twice the air handling, cooling and power capacity. 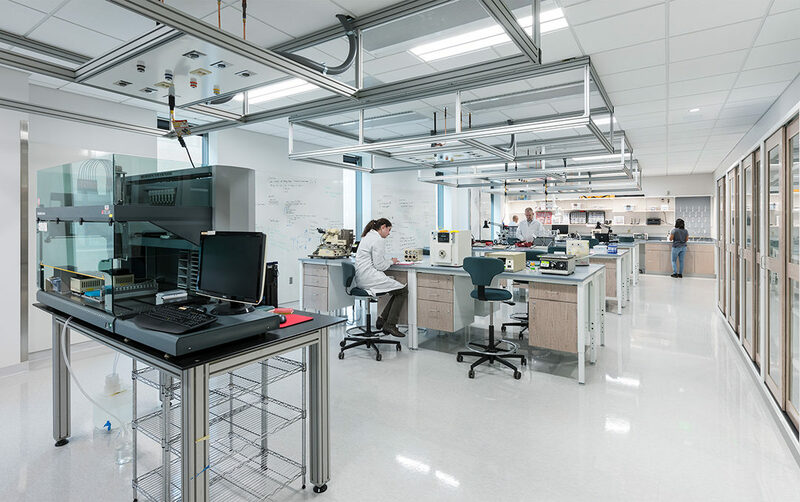 Like the basic laboratory zone, this area is designed with uninterrupted open spaces, but it is envisioned primarily for specialized environments such as imaging suites, clean rooms and those functions that require very tight control of temperature and humidity. 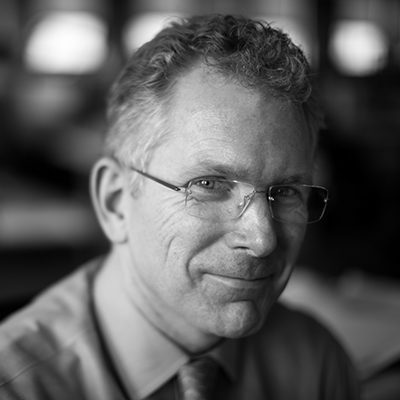 With the increasing interdependency of computational analysis of research data collection, it is more important than ever for laboratories and office/group work areas to be in close proximity with one another. Recognizing that these areas are far less demanding than true laboratories, a significant area of each floor is designed to more lenient structural and HVAC criteria. These areas benefit by their close connection to the exterior and are far more tolerant of environmental impacts from changing external conditions. By keeping it open and transparent, the office/computation provides a buffer wrapping around the research laboratory zone allowing for cascading air systems and significant reductions in the building’s overall energy demand. Opening in 2017, the flexible design of the Kilachand Center successfully achieved an interdisciplinary research environment for the University that can accommodate current scientific research while also offering an easily adaptable space for yet-to-be-defined future explorations.